Mixer Cable, 2x Speakers. Plug in your own Ipod/MP3 Player, Phone, CD player or laptop directly to the speakers (Headphone Out socket on your device). All cables & stands are supplied. This package includes full setup, training & collection within the local area. 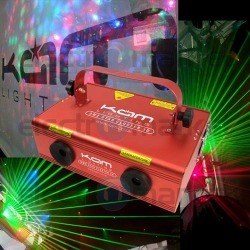 The perfect option for a party on a budget as you can plug in virtually any music source. Mixer Cable, 2x Speakers, 2x Lighting FX (enough for up to 100 People). Plug in your own Ipod/MP3 Player, CD player or laptop directly to the speakers (Headphone Out socket on your device). Lighting is all sound activated (in time to the music) All cables & lighting stand are supplied. 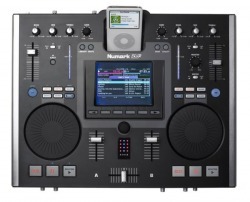 Mixer (with Ipod / Iphone dock or 2 inputs), 2x Speakers, 2x Lighting FX (enough for up to 100 People). 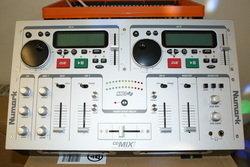 Plug in your own Ipod, MP3 Player, CD player or laptop to this mixer (2 inputs available). All cables,Lighting Stand, microphone & headphones are supplied. This package includes full setup, training & collection within the Colchester & Clacton areas. Lighting is all sound activated (in time to the music) All cables & lighting stand are supplied. The perfect option for a party on a budget as you can plug in virtually any music source with the added benefit of an Ipod dock which will also recharge it at the same time. 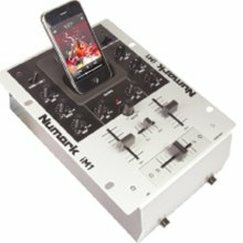 Ipod/MP3 Mixer (very easy to use with your own Ipod or USB Memory Stick), 2x Speakers, 3x Lighting FX (enough for up to 150 People). All cables,Lighting Stand, microphone & headphones are supplied. 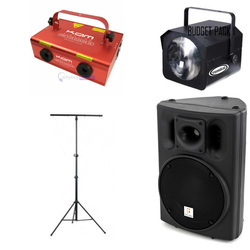 CD/MP3 Mixer, Large Speakers, 4x Lighting FX & Speaker Stands (enough for up to 200 People). All cables,Lighting Stand, microphone & headphones are supplied. 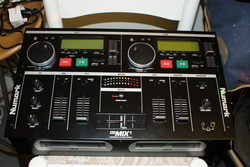 CD Mixer, Medium Speakers, 3x Lighting (enough for up to 150 People). All cables,Lighting Stand, microphone & headphones are supplied. 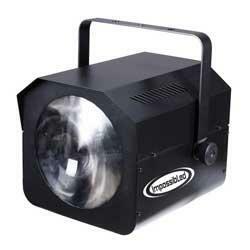 We also have a great selection of lighting available for Bands and Stage shows. Prices starting from £50.